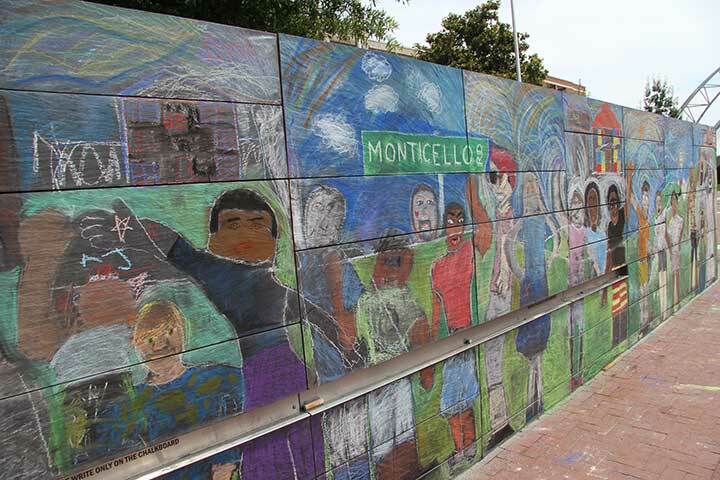 StoryLine was a three day Summer journey in which kids traced the route from Monticello to Main Street, culminating with a mural about the peolpe they met along the way. Here's some exciting news: a short documentary about the StoryLine Project will be screened in-situ at the Free Expression Wall during Family Day at the 2012 Virginia Film Festival. The November 3 program will begin at 6:00 p.m. with a brief presentation by Thomas Jefferson himself (actually a stand-in look-alike), followed by a Q&A and then the screening. It's free and open to the public. The Free Expression Monument is located at the East end of Charlottesville's historic Downtown Mall. To learn more about StoryLine (whose theme this year was Monticello Road) please read the thread on this blog or visit the project's web site.